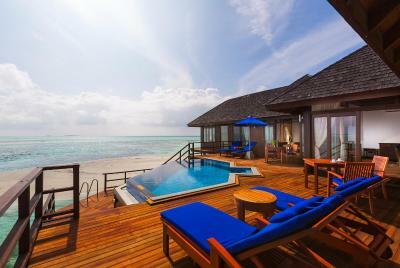 Lock in a great price for Olhuveli Beach & Spa Maldives – rated 8.6 by recent guests! Everything. We opted for Deluxe room and its was absolutely perfect. Delicious breakfast with wide spread buffet. Various dine out options, in villa dinning also available. Almost all the the water sports activities are available. It’s perfect for honeymooners and family bonding but maybe not for solo travelers like me. They have excellent facilities which allows you to relax and have fun with some water activities. Our villa location was very beautiful as it was sea facing, well maintained and properly cleaned always. Overall island is very well maintained. All inclusive package made our stay so relaxed and comfortable. Customer care was 10/10. Service was great! The buffet was amazing as well. Staff was extremely nice. 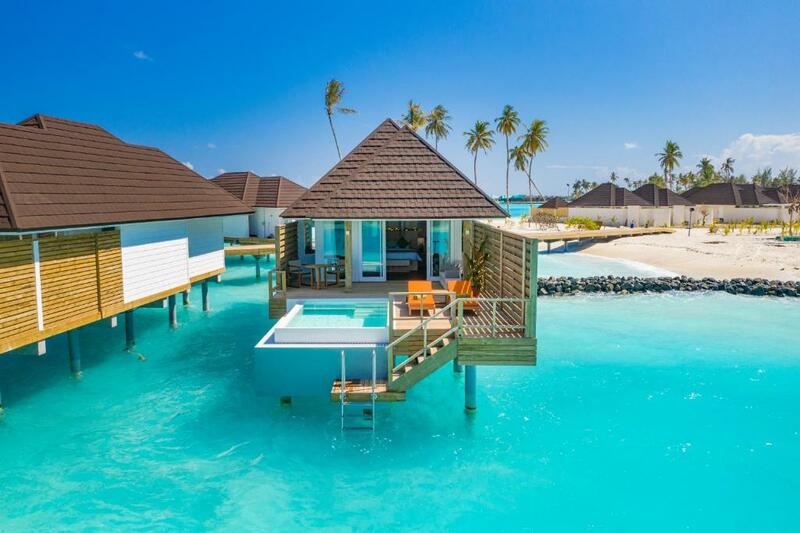 Location and water villas can't be beat. Food was excellent. Nice island, beautiful vegetation, very nice staff. We stayed at one of their Water Villa (Sunrise villa). They have 2 types sunrise and sunset villas. The view from our room was beautiful. All the safety equipments (safety tubes, lifejackets, umbrella) were placed properly in our room. We really like the placement of that comfortable sofa right in front of the big glass door. You can enjoy the beautiful view from inside of your room. The breakfast was very nice. Their clock system is unique, so basically you run 1 hr ahead of the Male time, which actually help in their systems. Everything was perfect , exceptional , the resort has everything we want , the food was wonderful , fantastic place , its natural aquarium, has a baby sharks everywhere and other fishes. The staff that always clean our room . 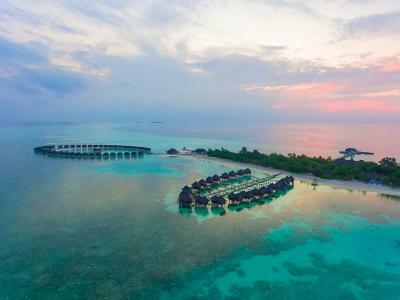 Olhuveli Beach & Spa Maldives This rating is a reflection of how the property compares to the industry standard when it comes to price, facilities and services available. It's based on a self-evaluation by the property. Use this rating to help choose your stay! One of our best sellers in South Male Atoll! At the tip of South Male Atoll, the luxurious Olhuveli Beach And Spa offers an island escape with 2 infinity pools and white sandy beaches. 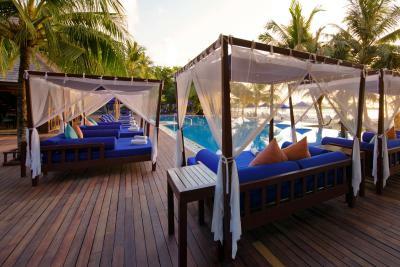 It is nestled within tropical gardens and has 4 restaurants, 3 bars and a PADI-certified dove school. Elegantly decorated with wooden furnishings, the spacious air-conditioned rooms and villas are equipped with a flat-screen TV, Chinese TV channels, DVD player and a mini-bar. Some villas come with a private sun deck and spa bath overlooking the Indian Ocean. Free WiFi is available in the rooms. 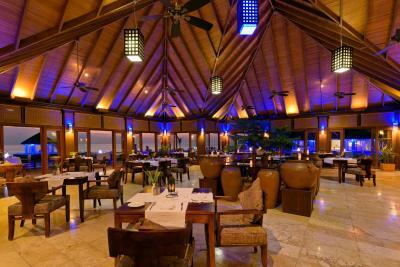 Olhuveli Beach And Spa Resort is a 45-minute speedboat ride from Male International Airport. Sun Spa features a menu of relaxing body massages, outdoor flower baths and beauty services. Guests may exercise at the gym, play a game of tennis or visit the souvenir shop. 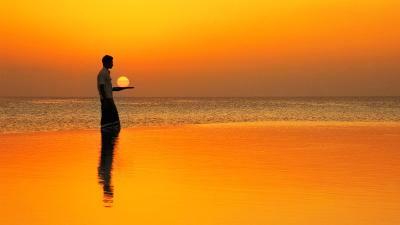 There is also a tour desk which organizes day trips for guests who wish to explore the island. Chinese speaking staff are available for assistance. Fresh seafood and an international buffet spread are available at Sunset Restaurant, while Lagoon serves an à la carte menu of Western delights. Other dining options include Asian food at The Four Spices and light meals at Island Pizza. 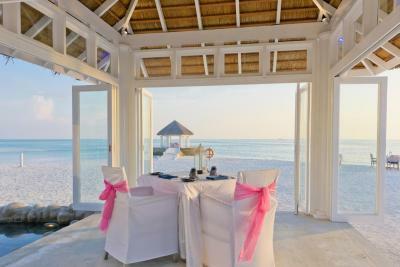 When would you like to stay at Olhuveli Beach & Spa Maldives? A beachfront room featuring a private balcony and spectacular views of the ocean. Built over the ocean, this villa offers spectacular ocean views and a spa bathtub on its private sun deck. It has rain shower facilities in its luxurious bathroom. Built over the ocean. This villa offers spectacular ocean & sunset views. 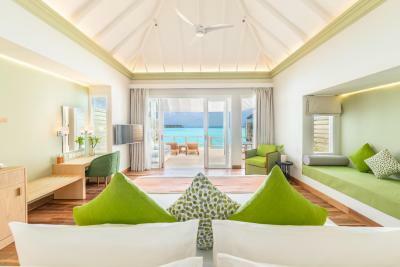 The Luxury bath room feature double vanity, rain shower and free standing bathtub offer uninhibited views of the lagoon beyond. Indulge in the private hot tub on the spacious deck. 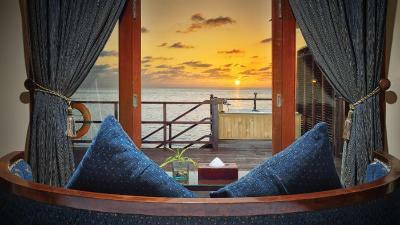 The luxurious Honeymoon Water Villa has a separate living room with a comfortable daybed. It also features a cable TV, DVD player and electric kettle. a bathtub, double vanity, open-air rain shower and sala. This villa features a tumble dryer, CD player and mini-bar. 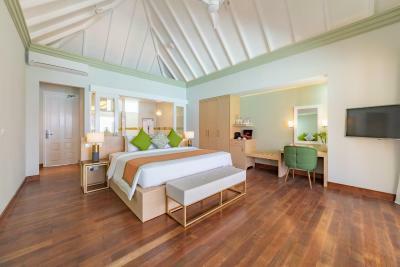 House Rules Olhuveli Beach & Spa Maldives takes special requests – add in the next step! Olhuveli Beach &amp; Spa Maldives accepts these cards and reserves the right to temporarily hold an amount prior to arrival. Olhuveli Beach & Spa Maldives accepts these cards and reserves the right to temporarily hold an amount prior to arrival. Please note that the property has a Christmas Eve (24-12) and New Year's Eve (31-12): USD - 350 net per adult & USD - 175 net per child under 11.99 years old. I booked half board as both my partner and I are not very big on lunch when we are on holiday, because we are normally busy at lunch. What we were not aware of was that all drinks, including water was also excluded from our packaging. Meaning, we had to pay resort price for everything we drank, this was not explained to us until our second day. Drinks are not even included at dinner, again not even water, imagine our surprise as we dis not know this at our first dinner, the bill was a whopping $165.00 as they also charged us for dinner. Maybe it's a language barrier but this pro ed to be very frustrating, I do not mind paying extra if I am aware and therefore am able to make an informed decision. This entire situation placed a damper on what should have been an amazing holiday. The staff were friendly and helpful, they did their best to make our stay pleasant. Of course they are limited by management policies which is where I had some issues. The weather was so hot and it makes moving around the resort uncomfortable at time. Some staff could be more courteous. Air conditioning in jacuzzi water villa was very bad.... the room size is too big for the ac provided...even ceiling fan is not effecient. Vegetarian food indian and other are simply not upto the mark...pasta,indian or chinese you name it was bad. Most restaurant staff were tired and bored while serving...they refused to send 4 empty plates and bowls to the room saying it is difficult and they dont have enough plates! Restaurant staff sweating due to running around while serving....restaurant in evening is not comfortable for both staff and guests. Not enough battery carts to help us move especially with kids in hand. High amount of Sea weed on the watervilla side...sea was good on beach villa side. Bizzare pricing for sports, scuba diving. Island was beautiful. Lots of swimming pools and pools are well maintained. 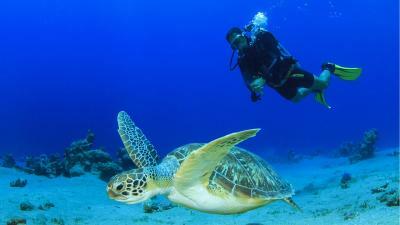 Good marine life in the sea. Too much sea weed were near to the shore and most of the reef at the hotel were dead. The older water villas were a little bit shabby and not as clean as the new ones. Couple activities were way too expensive, such as the whale shark trip. Rusty kettle but already replaced new one for us, no buggy during peak hour like check out time. 1. There should be more food variety. 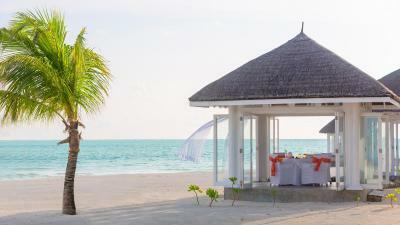 Compared to other Maldives resorts we have been food was not the strongest points. 2. Staff is too slow serving food and beverages. There is a lot of staff numbers but sometimes we enjoy a full meal and when we are finishing the beverages are served. This is totally unacceptable. This was experienced with the All included Package and also whenever it was items outside the package. 3. We experience sometimes that people which were travelling without small kids were being served faster and having tables for meals faster. Priority should be given to families travelling with small kids specially if they are infants. It’s a great resort and I hope they can take this feedback positively to improve; 1. Restaurants need an efficient reservation system. The only walk in is the buffet dinner at Subset restaurant. On multiple occasions we were asked to come after 9pm for walk-in dinner as all tables are reserved but we noticed that they are not even 40% occupied during that time. So it seems people reserve and then don’t turn up- in that case they should hold table for a limited time (just like any other restaurant in the world). We tried reserving through front desk and they said they will come back to us but no one got back (happened twice). 2. Most people come on HB or FB- if you are travelling on BB option like me let them know upfront- sort of changes their behaviour- I have no idea why 3. Construction going on at some parts as they are expanding- it’s windy at times and I saw flyway cement bag in those lovely waters. I think they try their best to keep the resort in pristine condition but will be great if they can be extra careful during this construction phase so as to not pollute the waters. 4. Overwater villa furniture is a bit dated- didn’t bother me but if you are very picky and want a swanky room then this is not for you. Nothing extremely bad to say, if you don’t like something the main thing is to allocate to the reception, as I said they are super helpful. Boat transfer is little expensive.